Once again, Book & Lyrics by Stephan DeGhelder, a comical series of events leaves a cash-strapped amateur theatre group without their one dependable moneymaker … the Christmas show! All seems lost until the loyal volunteer local actors suggest they do Dickens’ A CHRISTMAS CAROL even though the theatre hasn’t done it in years. 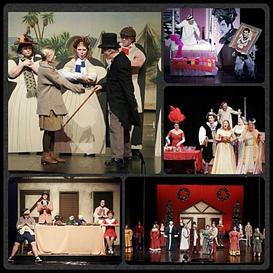 With only one night to prepare, and using only the sets from other plays and musicals, and with only the existing costumes they can scrounge in wardrobe and their own closets from previous shows, they bravely face the opening night audience in this hysterical musical farce.